Stir fries are so underappreciated in my house. I NEVER remember to make them, even though they’re fabulous. So easy to make, and there’s so many variations you can create with them! They also reheat perfectly for a quick lunch at the office. For once, I did remember how much I loved a quick stir fry! And these sauteed root veggies are a great side dish for your winter meals. 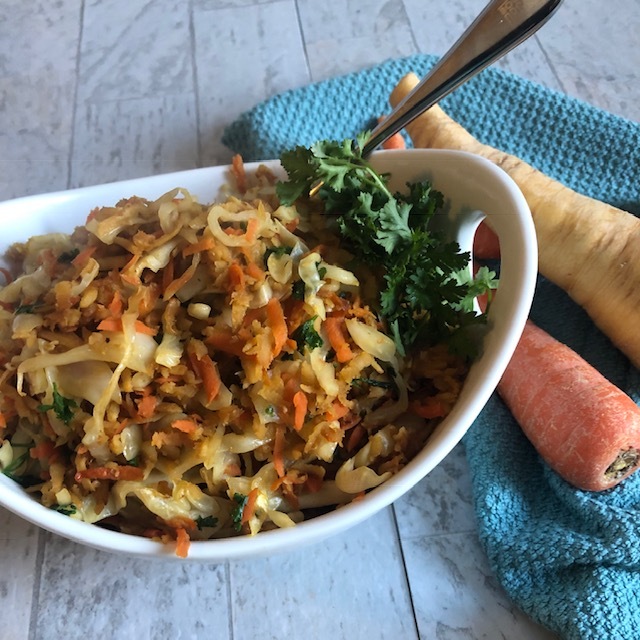 While I’m personally done with Whole30 now, if you’re setting out on a new round, this side dish is perfect for that! It’s grain free, dairy free, sugar free, and Paleo but still gives the essence of a teriyaki with the addition of coconut aminos. I know the Paleo/Whole30 community push coconut aminos as a soy free/gluten free alternative to soy sauce, but I honestly think it tastes nothing like soy sauce. It’s much sweeter and while dark in color like soy, it definitely reminds me more of a watery version of teriyaki. Which is not a bad thing! Who doesn’t love teriyaki? I grated carrots, parsnips, and a Hanna sweet potato (that’s the white one, versus the orange colored version) together with some shredded cabbage and onion. Parsnips are a fairly new addition to my diet and I’m quickly learning to love them! I mashed a bunch last week with plenty of ghee and almond milk and they were delectable. Light and creamy, they were reminiscent of potatoes. Milder than a turnip, they look like a white carrot! Have you ever tried parsnips before? What did you think? If you have some amazing recipes that feature parsnips, be sure to send them my way! 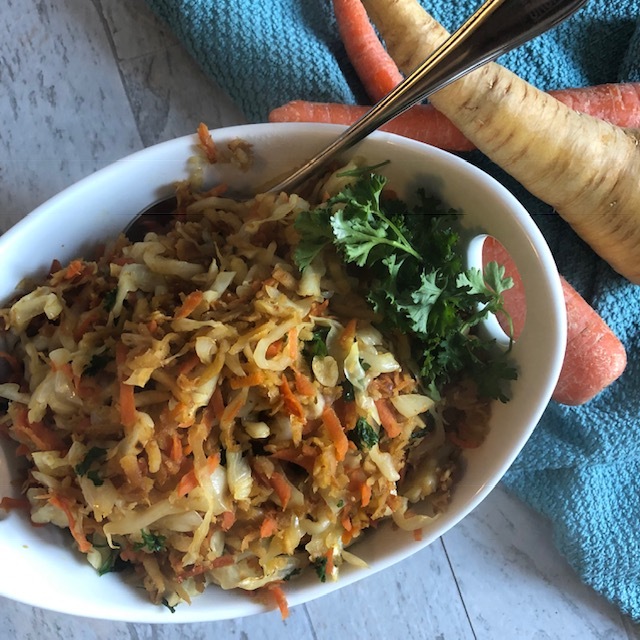 I’m all about experimenting with new dishes that feature my new favorite root veggie! If you’ve never had a parsnip, try this recipe for sauteed root veggies. It’s a great way to introduce a new food into your diet! Heat sesame oil in large wok or skillet over medium high heat. Add parsnip, carrots,sweet potato, and onions to wok and stir fry 8-10 minutes until lightly browned. Add garlic, coconut aminos, fish oil, and salt and pepper to pan. Toss to coat.